After watching the video back, the reporter said it was a "shocker" to have been so close to the snake. Reporters often deal with interesting personalities sneaking up behind them during on-camera reports. It's usually to throw up a peace sign or to say hi to the folks watching at home. It's just part of the trade. KMIR NBC Palm Springs reporter Luzdelia Caballero had something similar happen to her while she set up her camera to report near the Salton Sea on Wednesday. She too, encountered an uninvited guest, but this time it turned out to be a venomous rattlesnake. The full video report that Caballero appeared on was uploaded to her Facebook page, snake and all. "#SCARE The dangers of reporting...I guess there was a RATTLESNAKE behind me during my stand-up!" Caballero wrote. Caballero told NBC4 it was a "shocker" to have been so close to the snake. She was at North Shore in Riverside County that day covering a lengthy meeting about a Salton Sea management program. During a break in the meeting, Caballero interviewed sources for her story outside and filmed a "stand up" shot in front of the camera by the shore. 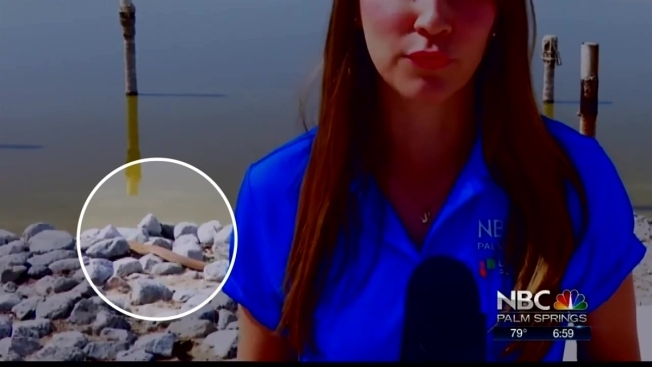 The video shows Caballero practicing her lines before her live shot, while a rattlesnake slowly slithers by just a few feet behind her -- unbeknownst to the reporter. When the meeting resumed, Caballero said she noticed people in the meeting room began to shift to the left side of the building. It turns out those people were gawking at the rattlesnake. Caballero said she posted a video of the snake on her Snapchat story. Later, she discovered that same snake was behind her just moments prior. "I'm terrified of snakes," she said. "If things would've gone differently, it would've gone south quick. I'm happy to be here and say nothing happened." Caballero said her coworkers at the station FaceTimed her to tell her that a viewer emailed the station warning them of the snake. Caballero said it's common to see such reptiles during warmer seasons in Palm Springs. For the two years that she's worked there, Caballero said that snakes have made several cameo appearances during other past reports. She said that while covering stories about the local zoo, rattlesnakes could be seen slithering across walkways guests use to view the animals. "It's something we can marvel over now," Caballero said. "Thankfully, it didn't go the the extreme."